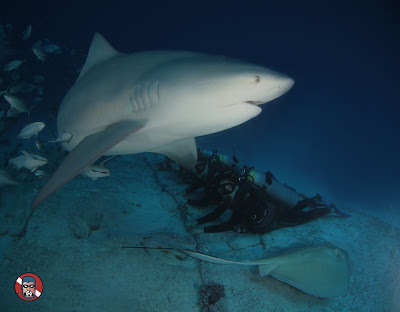 HomeBlogBUCEO CARIBE MEXICANOHow about diving with bull sharks? If you’re ready for this pure adrenaline adventure, check it out and join Phantom Divers on the ride of your life. You can not miss this season! While most divers around the world look for beauty and tranquility that transmits a colorful coral reef, others look for a unique experience like diving with the imposing bull shark. The Toro Sharks visit the shores of Playa del Carmen in Mexico every winter from November to March. Females arrive in a pregnant state to give birth to their young and deposit them in the coastal lagoons and mangroves, where they will feed on the nutrients until they reach the juvenile stage and then leave for other waters. This is where Phantom Divers, pioneers in the Mexican Caribbean with more than 20 years of experience in diving with bull sharks, have developed their own technique to make this a safe, educational and unforgettable dive. Increase your level of adrenaline and get ready to be surrounded by 8 to 25 large pregnant females and do not miss the opportunity to admire the best of nature at first hand. Below you can see the explanatory video of this dive. If you are ready to change your way of seeing nature forever, take the first step by sending an email to INFO@PHANTOMDIVERS.COM to get more information about how you can also live the adventure of your life.